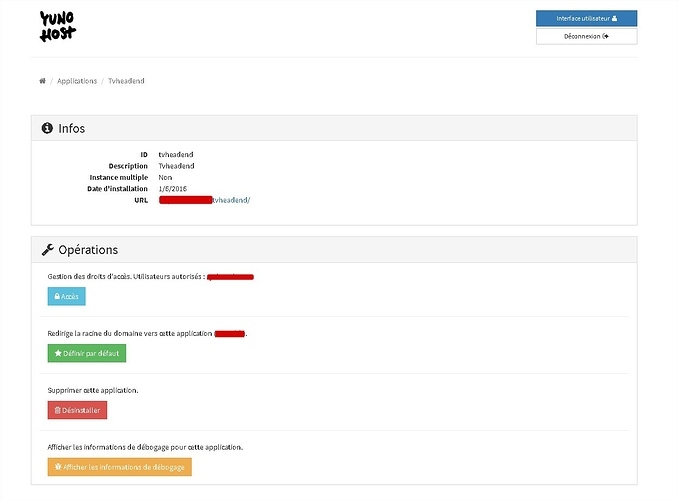 bien sur ça ne marche pas, pourtant l’install semble bien s’installer, comment ajouter l’accès du logiciel à yunoHost, svp ?  Yunohost package to install Tvheadend on server. 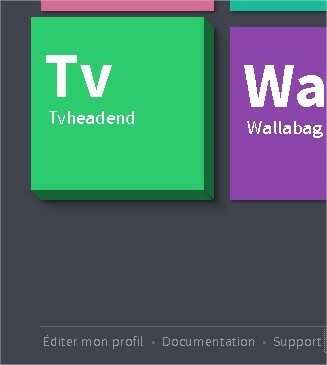 Contribute to tuxmouraille/tvheadend_ynh development by creating an account on GitHub. Et ils ne te doivent d’autant plus rien si tu ne contribue pas directement ou indirectement au projet (c.f. les points suivants). Tout a un coût dans la vie, et le logiciel libre n’y échappe pas : il est à prix libre, que ce soit en termes financiers ou en terme de temps / patience. Les autres solutions, ce sont les GAFAMs et les logiciels proprios que tu paieras avec tes données personelles et/ou (beaucoup) d’argent. En tout cas, une chose est sur : si l’on ne donne rien, il n’est pas légitime de râler. bien sur tu as raison, c’est sur le coup, car j’ai perdu tout ma conf et qu’il faut que je me refasse toute ma conf et que ça fonctionne pas comme ça devrais. As tu répondu à @frju365 qui semblait intéressé pour filer un coup de main ? Can you try to install again with --debug, so that your log is more talkative about the error? 42754 DEBUG 0 upgraded, 0 newly installed, 0 to remove and 21 not upgraded. Here you go. Fortunately tvheadend has been updated to Stretch, so it’s the package’s fault. I have just put a PR on your fork. I have done it blindly, I do not guarantee that it will work right away. Try again with the --debug option to see if there is another issue. 67129 WARNING Packagers /!\ : 'app checkurl' is deprecated ! Please use the helper 'ynh_webpath_register' instead ! 117335 DEBUG apt-transport-https is already the newest version (1.4.8). 117336 DEBUG 0 upgraded, 0 newly installed, 0 to remove and 21 not upgraded. 156691 DEBUG 0 upgraded, 106 newly installed, 0 to remove and 21 not upgraded. 156692 DEBUG Need to get 15.4 MB of archives. 156693 DEBUG After this operation, 94.6 MB of additional disk space will be used. 228708 DEBUG Selecting previously unselected package libdvbcsa1:armhf. 230631 DEBUG Selecting previously unselected package libalgorithm-c3-perl. 231499 DEBUG Selecting previously unselected package libparams-classify-perl. 232409 DEBUG Selecting previously unselected package libmodule-runtime-perl. 232917 DEBUG Selecting previously unselected package libtry-tiny-perl. 233827 DEBUG Selecting previously unselected package libmodule-implementation-perl. 234236 DEBUG Selecting previously unselected package libsub-exporter-progressive-perl. 235146 DEBUG Selecting previously unselected package libvariable-magic-perl. 235654 DEBUG Selecting previously unselected package libb-hooks-endofscope-perl. 236393 DEBUG Selecting previously unselected package libclass-c3-perl. 236900 DEBUG Selecting previously unselected package libclass-c3-xs-perl. 237774 DEBUG Selecting previously unselected package libclass-data-inheritable-perl. 238182 DEBUG Selecting previously unselected package libclass-factory-util-perl. 239192 DEBUG Selecting previously unselected package libclass-inspector-perl. 239699 DEBUG Selecting previously unselected package libclass-method-modifiers-perl. 240008 DEBUG Selecting previously unselected package libclass-methodmaker-perl. 246633 DEBUG Selecting previously unselected package libclass-singleton-perl. 247538 DEBUG Selecting previously unselected package libcommon-sense-perl. 248045 DEBUG Selecting previously unselected package libconvert-binhex-perl. 248954 DEBUG Selecting previously unselected package libdata-dump-perl. 249462 DEBUG Selecting previously unselected package libparams-util-perl. 250373 DEBUG Selecting previously unselected package libsub-install-perl. 250781 DEBUG Selecting previously unselected package libdata-optlist-perl. 251588 DEBUG Selecting previously unselected package libdate-manip-perl. 259015 DEBUG Selecting previously unselected package libpackage-stash-perl. 262138 DEBUG Selecting previously unselected package libsub-identify-perl. 263045 DEBUG Selecting previously unselected package libsub-name-perl. 263652 DEBUG Selecting previously unselected package libnamespace-clean-perl. 263957 DEBUG Selecting previously unselected package libnamespace-autoclean-perl. 264263 DEBUG Selecting previously unselected package libsub-exporter-perl. 264571 DEBUG Selecting previously unselected package libeval-closure-perl. 264877 DEBUG Selecting previously unselected package libdevel-stacktrace-perl. 265183 DEBUG Selecting previously unselected package libexception-class-perl. 266191 DEBUG Selecting previously unselected package libscalar-list-utils-perl. 267302 DEBUG Selecting previously unselected package libparams-validationcompiler-perl. 268011 DEBUG Selecting previously unselected package libmro-compat-perl. 268518 DEBUG Selecting previously unselected package librole-tiny-perl. 269432 DEBUG Selecting previously unselected package libtest-fatal-perl. 270441 DEBUG Selecting previously unselected package libspecio-perl. 271548 DEBUG Selecting previously unselected package libdatetime-locale-perl. 278572 DEBUG Selecting previously unselected package libdatetime-timezone-perl. 280283 DEBUG Selecting previously unselected package libdatetime-perl. 280591 DEBUG Selecting previously unselected package libpackage-deprecationmanager-perl. 280795 DEBUG Selecting previously unselected package libdatetime-format-strptime-perl. 281098 DEBUG Selecting previously unselected package libparams-validate-perl. 281404 DEBUG Selecting previously unselected package libdatetime-format-builder-perl. 281709 DEBUG Selecting previously unselected package libdatetime-format-iso8601-perl. 282012 DEBUG Selecting previously unselected package libdatetime-format-sqlite-perl. 282215 DEBUG Selecting previously unselected package libdbd-sqlite3-perl. 282620 DEBUG Selecting previously unselected package libpadwalker-perl. 282823 DEBUG Selecting previously unselected package libdevel-caller-perl. 283628 DEBUG Selecting previously unselected package libdevel-lexalias-perl. 284134 DEBUG Selecting previously unselected package libemail-address-perl. 285143 DEBUG Selecting previously unselected package libnet-domain-tld-perl. 285650 DEBUG Selecting previously unselected package libemail-valid-perl. 286457 DEBUG Selecting previously unselected package libemail-find-perl. 286963 DEBUG Selecting previously unselected package libexporter-lite-perl. 287168 DEBUG Selecting previously unselected package libexporter-tiny-perl. 287574 DEBUG Selecting previously unselected package libfile-chdir-perl. 287879 DEBUG Selecting previously unselected package libfile-which-perl. 288093 DEBUG Selecting previously unselected package libfile-homedir-perl. 288498 DEBUG Selecting previously unselected package libfile-slurp-perl. 289403 DEBUG Selecting previously unselected package libhdhomerun3. 290112 DEBUG Selecting previously unselected package libregexp-common-perl. 291234 DEBUG Selecting previously unselected package libhtml-fromtext-perl. 293747 DEBUG Selecting previously unselected package libhtml-tableextract-perl. 294755 DEBUG Selecting previously unselected package libhttp-cache-transparent-perl. 295362 DEBUG Selecting previously unselected package libhttp-server-simple-perl. 296269 DEBUG Selecting previously unselected package libio-sessiondata-perl. 297177 DEBUG Selecting previously unselected package libio-stringy-perl. 298287 DEBUG Selecting previously unselected package libjson-perl. 298894 DEBUG Selecting previously unselected package libtypes-serialiser-perl. 299803 DEBUG Selecting previously unselected package libjson-xs-perl. 300411 DEBUG Selecting previously unselected package liblog-tracemessages-perl. 300717 DEBUG Selecting previously unselected package liblingua-preferred-perl. 301022 DEBUG Selecting previously unselected package liblist-moreutils-perl. 301328 DEBUG Selecting previously unselected package libmime-tools-perl. 301832 DEBUG Selecting previously unselected package libossp-uuid16:armhf. 302439 DEBUG Selecting previously unselected package libossp-uuid-perl. 303155 DEBUG Selecting previously unselected package libpackage-stash-xs-perl. 303561 DEBUG Selecting previously unselected package libparse-recdescent-perl. 304469 DEBUG Selecting previously unselected package libtask-weaken-perl. 305376 DEBUG Selecting previously unselected package libsoap-lite-perl. 306991 DEBUG Selecting previously unselected package libterm-progressbar-perl. 307295 DEBUG Selecting previously unselected package libunicode-string-perl. 307701 DEBUG Selecting previously unselected package liburiparser1:armhf. 308004 DEBUG Selecting previously unselected package libwww-mechanize-perl. 308309 DEBUG Selecting previously unselected package libxml-perl. 308715 DEBUG Selecting previously unselected package libxml-regexp-perl. 308918 DEBUG Selecting previously unselected package libxml-dom-perl. 309322 DEBUG Selecting previously unselected package libxml-namespacesupport-perl. 309628 DEBUG Selecting previously unselected package libxml-sax-base-perl. 309933 DEBUG Selecting previously unselected package libxml-sax-perl. 311041 DEBUG Selecting previously unselected package libxml-libxml-perl. 312157 DEBUG Selecting previously unselected package libxml-libxslt-perl. 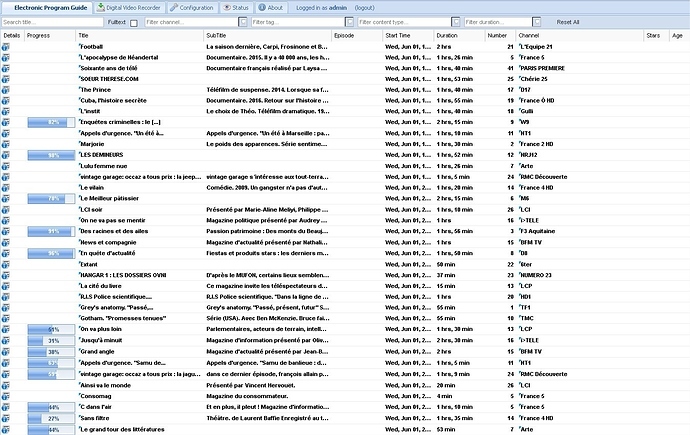 312965 DEBUG Selecting previously unselected package libxml-sax-expat-perl. 313475 DEBUG Selecting previously unselected package libxml-treepp-perl. 314307 DEBUG Selecting previously unselected package libxml-writer-perl. 314713 DEBUG Selecting previously unselected package libxmlrpc-lite-perl. 315622 DEBUG Selecting previously unselected package libxmltv-perl. 316831 DEBUG Selecting previously unselected package libtext-bidi-perl. 317338 DEBUG Selecting previously unselected package xmltv-util. 317943 DEBUG Selecting previously unselected package dtv-scan-tables. 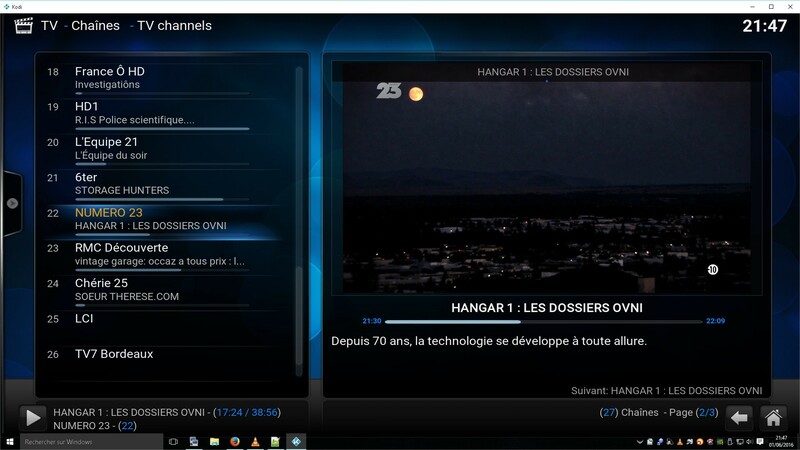 323564 DEBUG Selecting previously unselected package dvb-apps. 328784 DEBUG Selecting previously unselected package tvheadend-data. 333503 DEBUG Selecting previously unselected package tvheadend. Tu as la réponse ici. Mais comme il n’a pas réussi à copier le fichier superuser, ça risque de ne pas marcher. 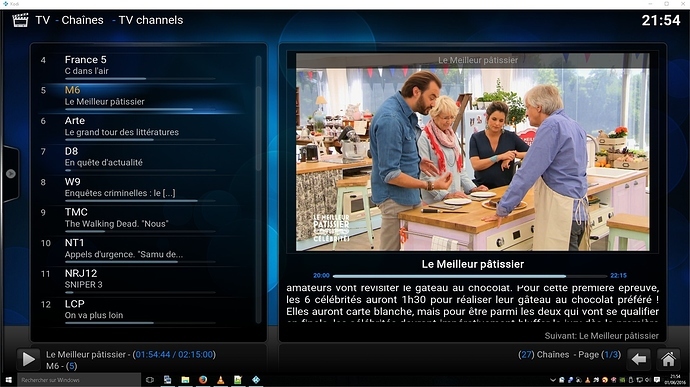 Essaie déjà de te connecter avec l’identifiant tvheadend et le mot de passe E8dv94xQ. 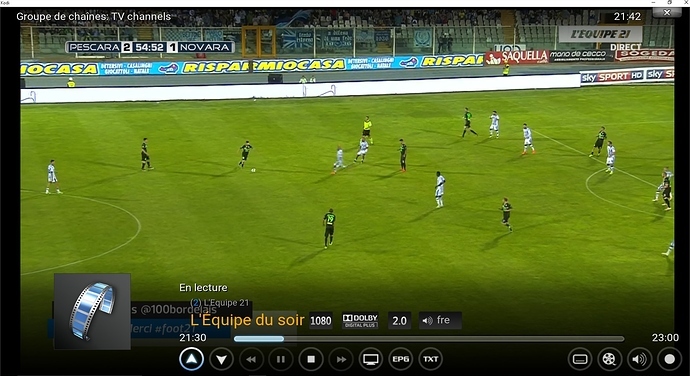 effectivement dans le home il n’y a pas de fichier de conf /home/hts, ou il a bien pus l’installer ? Peux-tu faire un sudo service tvheadend status ? J’ai créé une PR pour essayer de corriger ça à la volée (à faire: adapter le script remove à cette dernière modification). Ce paquet aura besoin d’un refactoring. refactoring ? kesaco stp ? OK, le service fonctionne bien a priori. 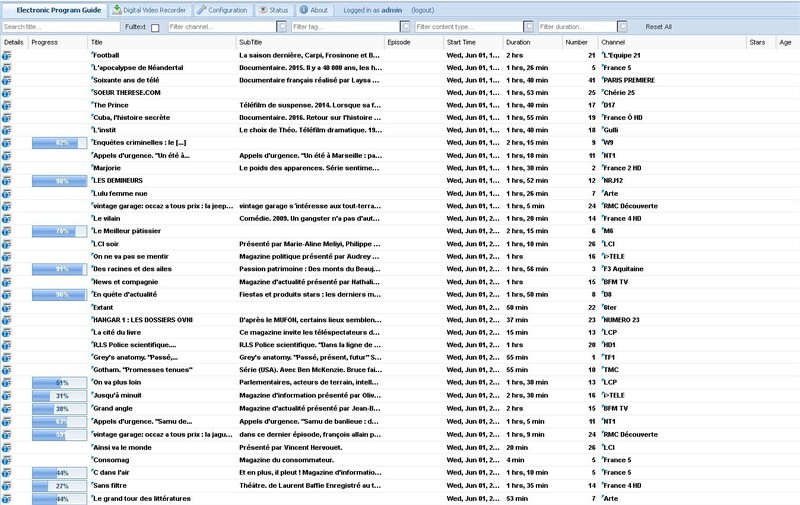 Il s’agit juste d’un problème avec le fichier du superuser. Le refactoring c’est reprendre le code pour qu’il soit plus clair et qu’il utilise les fonctions et helpers qui ont été ajoutées à YNH depuis sa dernière mise à jour. Il y a quelques avertissements sur l’utilisation de fonctions dépréciées. Déjà, résolvons ce problème.